Vietnamese cuisine is popular in many countries. Most of the Vietnamese dishes are the unique combination of a variety of fresh herbs, vegetables, meat and spices. Our guide Top 10 must try food in Ho Chi Minh will suggest you the best local restaurants to enjoy best food in Ho Chi Minh. Literally, Cơm tấm is broken rice, which is partially broken during the milling process. “Suon bi” means the pork meat. Apart from being made by the special rice, Com tam is served with a grilled pork chop on top. Local people usually eat this dish with fish sauce, cucumber pickles, green onions, and chilies. If you are bored with the basic version of Com Tam with pork, don't mind adding some extra ingredients as a fried egg, pig skin, Vietnamese meatloaf to the dish. All of them come perfectly together in one plate. It’s not difficult to find a stall selling Com Tam suon bi as there is a big selection most readily available around Sai Gon. Address: 84 Đặng Văn Ngữ Street, 10 Ward, Phu Nhuan District, Ho Chi Minh City. Opening hours: 6 am – 10 pm daily. Price: About 30,000 to 40,000 VND (about 1,5 to 2 USD) for a regular dish. For extra things added to your dish, you will be charged more. Address: 54-57 Bửu Đình Street, Ward 5, District 6, Ho Chi Minh City. Address: 70-72 Võ Văn Tần, Ward 5, District 3, Ho Chi Minh city. Basically, Hủ Tiếu Nam Vang has its origin from the Cambodian and Chinese noodle soup which consists of all sorts of sliced organs, shrimp, and other additions. Today, it’s most often found in small restaurants that spill out on the street. The local have it for breakfast, lunch, dinner or even a late night meal. Address: 72 Nguyễn Thượng Hiền street, District 3, Ho Chi Minh city. Address: 110 Hùng Vương, Ward 9, District 5, Ho Chi Minh city. Address: 389 – 391 Võ Văn Tần Street, Ward 5, District 3, Ho Chi Minh city. Ốc or “Snail” in English is a dish that sounds unappetizing but taste wonderful. For years, Ốc has become a specialty in Sai Gon, which people shouldn’t miss a chance to try. Ốc is now a major part of the Vietnamese culture of Saigon. Don’t be surprised if you see dozens of different snails displayed freshly in front of the stall. They are readily for you to choose. Other seafood as shrimp, crab, clams; blood cockles are served as well. Generally, there are about 7 to 10 ways of cooking snails. Snails can be grilled, boiled, coated in salt and chili, steamed and so on. Note that the ordering process can be quite tough but funny. Even though you know which type of snail you choose for dinner, you have no idea how they are cooked as the cooking method is not explained in English. But don’t stick into that thought. Sometimes, randomly eat something you don’t have any idea is truly a wonderful tough! Just enjoy by yourself! Address: 212B/C79 Nguyen Trãi, Nguyen Cu Trinh Ward, District 1, Ho Chi Minh city. Address : 433/28 Lê Đại Hành, Ward 11 , District 11, Ho Chi Minh city. Oc Mot in Ho Chi Minh has its own particular dishes and such a distinctive processing feature makes you want to always remember when in need of joyful moments with friends and relatives. Next up is another noodle in Sai Gon, which has a completely different taste from Phở. It is Bún Riêu cua (bun rieu cua). To make a quality bowl of bun rieu cua, it requires a lot of work. The cook has to wake up at early morning to make preration for broth which states for the delicacy and tastiness of bun rieu. From the first spoon of bun rieu cua, you can totally feel the slight sweetness of the broth made from a crab base stock and tomatoes. Along with Pho, bun rieu cua is easily ranked as the most favorite noodles for all foodies. If giving a small notice, you can see that there is always fresh herb served together with most dishes in Viet Nam. And bun rieu is not an exception. This dish is served with vegetable to balance the Ying-yang in our body. Do you know what the favorite thing young people usually do after school is? It’s going to a stall selling Bánh tráng trộn. Beacause banh trang tron is the most likeable and affordable snack for people of all ages, especially youngster. “Trộn” has its meaning as the mix of several ingredients in one dish. In Banh Trang Tron, that is the combination of shredded rice paper, seasoned with a chili sauce, and filled with herbs like Vietnamese coriander and basil and supplemented with pieces of squid, dried beef, salty fish, and quail eggs. Many people are fond of sitting at street vendors, eating banh trang tron and gossiping about their and others’ lives. Banh trang tron is so well-liked that many domestic tourists buy this snack as a gift when returning home. Notre Dame Cathedral and Turtle Lake at night: Dragging around these places at night, you can see how the nightlife of Sai Gon is. There are several groups hanging out together, chatting while eating banh trang tron. Therefore, the stalls selling this favorite dish is the most usual image in Notre Dame Cathedral and Turtle Lake. Banh Trang Tron Chu Vien becomes more and more popular to the young generation of Ho Chi Minh. Banh trang tron is a cheap and interesting foods of local. Some Vietnamese food is truly challenging for appetizers and bun mam is one of them. Many people especially foreigners can't stand on its pungent smell but you know what? That special smell really makes bun mam stand out. The soup broth made from the fermented fish sauce is used with rice vermicelli noodles at the bottom and the sorts of meats like squid, prawns, and pork on top. Don't forget to add some vegetable to get a taste of sensation in your mouth. Apart from Bun rieu, Bun mam is another kind of noodle that all tourists need to try to finish their trips. Banh mi which is influenced by French baguettes has been so popular to the Vietnamese and appealing to all tourists. If you go to Sai Gon without trying Banh Mi, it’s surely a big mistake. Banh Mi is sold in the carts and stalls lining on busy streets and quiet alleys. For a long time, banh mi is now undeniably a great choice for breakfast, lunch or even dinner for many Vietnamese. A small banh mi is full filled with about ten ingredients ranging from pork, butter, slices of cucumber, chopped tomatoes, luncheon meats, shredded cured pork skin, pâté, mayonnaise, Vietnamese radish and carrot pickles. Addition to its diversified components, what people like about banh mi is its inexpensive price and convenient size to take away. Nowadays, more and more tourists making their way to look for a small version of banh Xeo named bánh Khọt. If you are a fan of banh Xeo, you will assuredly enjoy banh khot too. The batter of bánh Khọt is made from rice flour, sometimes even leftover rice like in Helen’s recipe, coconut milk, and a hint of turmeric powder to give it that slightly yellow color. Toppings consist of a shrimp with a sprinkle of green onions. More importantly, bánh Khọt has to be served with sweet fish sauce which set banh khot apart from other pancakes. Price: 20,000 VND ($0.92) for a plate that included about 10 pieces. Price: 50,000 VND (the price here is higher than average but it’s space is much larger, suitable for family and kids). To perfectly end this list, Bò lá lốt should be the one. 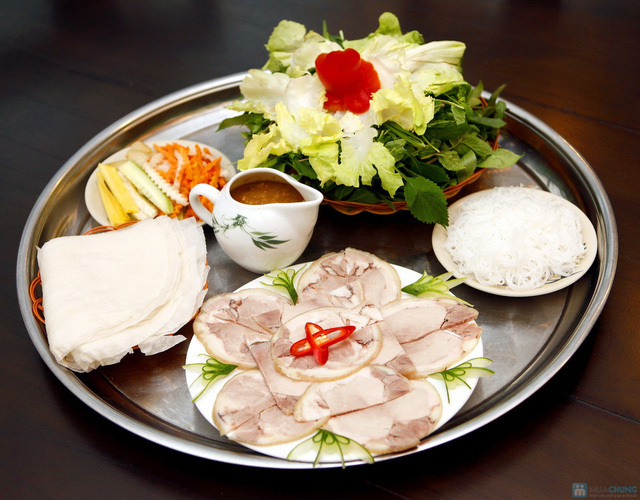 Bò lá lốt is one of the most famous Vietnamese dishes has got to be eaten by all foodies. Bò lá lốt is the fermented pork meat rolled with lá lốt and tightly wrapped into thin tubes. Then, all of these meat tubes will be grilled over charcoal to create a dish with slight dark in color and smoky tempting flavor. A plate of bo la lot is then served with rice paper, a typical bounty of leaves and herbs, chilies of course. Bò lá lốt turns out to be one of the most favorable options for dinner. It’s why you can easily stumble across a stall selling this food throughout Sai Gon. Are you looking for a healthy dish for your lunch or dinner? Why don’t you try Vietnamese food with less fat and more vegetables? PLAN A TRIP TO HO CHI MINH with Justgola now!